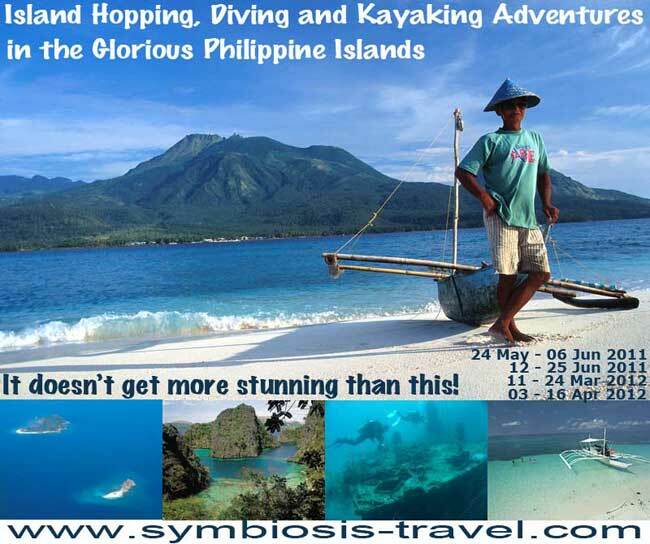 Last minute 10% discount off our Philippines Island Hopping, Diving & Kayaking Safari commencing in Manila, Philippines, on 24 May. This is an exceptional trip for anyone who enjoys getting away from the tourist haunts and into the wild, likes a dash of real adventure, plus some of the best diving in the Philippines… including the amazing Coron Wrecks – the world’s second largest sunken fleet of WWII shipwrecks. Perfect for divers of all standards, and for divers with non-diving partners as there is plenty to enjoy beyond the diving. If you don’t dive but would like to learn, or do dive and would like to advance your skills training, the first few days provide the perfect opportunity to do a PADI dive course. Discount of 10% off the basic safari cost, excluding diving. Was $1,505 + diving, now $1,355 + diving. Save $150. Contact Symbiosis NOW to book a space.